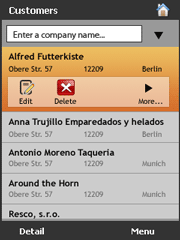 The success of contemporary mobile applications is determined by both, rich functionality and attractive GUI. Let's find a way how to be successful and effective in development of such applications. When developing a mobile app you can decide on platforms such as Android, Windows Mobile, iPhone. We will pick Windows Mobile from the three ones mentioned above. The reasons are quite obvious - the development is done in Microsoft Visual Studio - the most popular development environment in developer community. Many companies have already developed their desktop solutions using Visual Studio and have relevant knowledge and experience that can be used for creating mobile solutions. The only aspect that needs to be customized is UI. 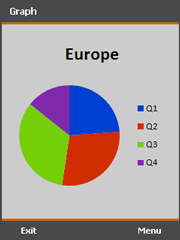 Moreover, Windows Mobile platform represent the largest market share, plus the mobile app can be easily uploaded to the device. We will use Visual Studio and C# programming language. 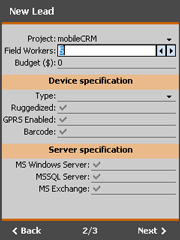 In order to be successful we employ in the third party's components; to be specific - Resco MobileForms Toolkit. 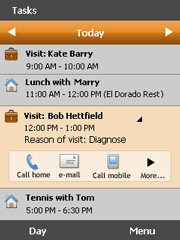 The list is one of the most used ways of displaying data on a mobile device screen. Instead of using standard Visual Studio list control we use Resco AdvancedList for .NET CF. This component abounds in extremely rich functionality. Moreover, it has impressive graphics. The whole component completely supports finger touch scrolling, and can handle tons of data due to DelayLoad functionality. DelayLoad functionality loads only visible data, thus solves limited hardware performance of mobile devices. 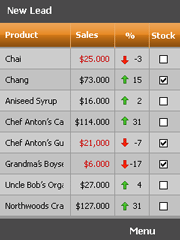 One another way of data displaying is using a grid. The grid from Resco - Resco SmartGrid for .NET CF disposes of several formatting opportunities, e.g. CustomizeCell Event, or different cell styles. Moreover, this component has built-in auto edit tools: textbox, checkbox, and custom control. What might catch your interesting is the possibility to create graphically attractive design. The component supports gradient colors and different graphic capabilities. It has full touch scroll support plus XML Templates support. 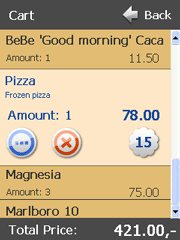 After we solved the way how to display the data, let's focus on data input, particularly on creating mobile user input forms. Very smart way is deploying Resco DetailView for .NET CF. 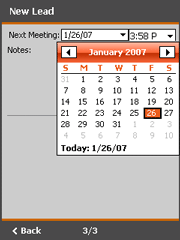 Input controls are collected in a compact environment that gives the form standard Windows Mobile look and feel. 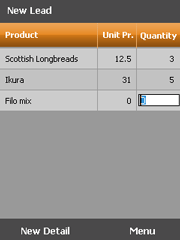 The component supports multi-page that allows you dividing long content into several subpages. 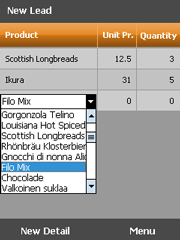 Moreover, it supports all standard input methods: ComboBox, CheckBox, text items, and numeric items. The whole layout is fully customizable - label width adjustment, ForeColor, BackColor, Font, Alignment; Border properties can be set easily. The matter of course is support of finger touch. Data presentation can be done in various ways. 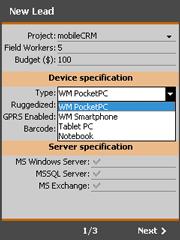 When working in mobile environment the opportunities are limited. 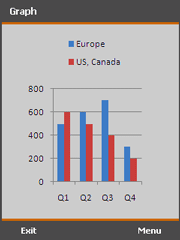 The best way to present collected data on your device is using charts - Resco CompactChart for .NET CF. Not only is it optimized for mobile environment and allows data binding through dataset but offers up to 5 chart types - Pie, Bar, Line, Doughnut, and Area. That is the widest chart portfolio in the market. Make it modern, navigate easily! Shortcuts are used in almost every modern mobile app. They do both, look good and modern, and contribute to a friendlier navigation. You can find brilliant component in Resco's Toolkit called Resco ShortcutBar for .NET CF. Shortcuts can be cozily grouped and graphically modified - gradient color and multiple graphic options. Yes, I also prefer Windows Mobile, because it supports Visual studio. 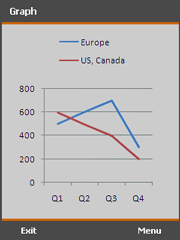 Windows Phone is catching a lot of business. IMO, it will beat other Smart phones.